We provide a full range of services for all your car body repair and respray needs. All our work is guaranteed to be up to our impeccable high standards. Feel free to pop in for a no-charge estimate. We take all makes and models with no job too large or small. Our craft is car body repair. We'll restore your vehicle to a good as new state. We guarantee an absolute colour match on all our respray work. 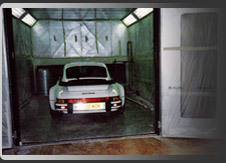 We have the on-site facilities to repair and respray any long wheel based vehicles. If your insurance covers your repair we can help you deal with the insurance company. picking up your repaired car feel as good as the day you bought it.